DUCT CLEANING | Wythe Sheet Metal, Inc. Even if no one in your household suffers from chronic allergies or respiratory problems, cleaner air makes it easier for everyone to breathe. Even among the healthiest of people, dust and pollutants entering the nose and lungs can trigger sneezing and coughing, as well as sinus and bronchial congestion. Air duct cleaning creates a more comfortable environment and promotes well-being. Given the choice between clean air and dirty air, which would you rather breathe? Visit http://www.wythesheetmetalinc.com/ for more information. 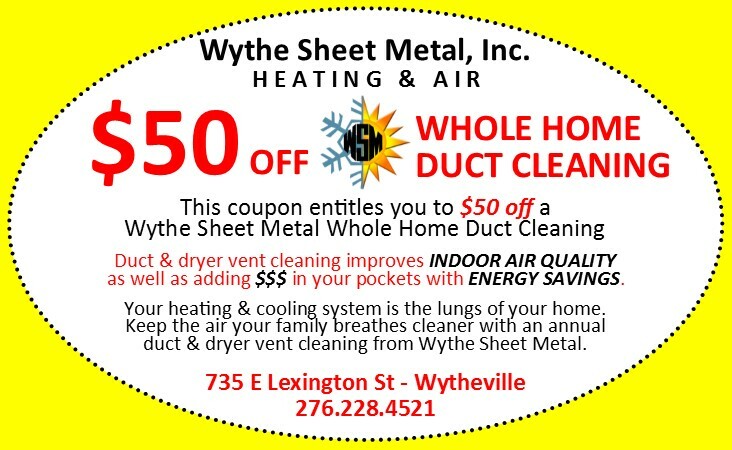 Mention the coupon below when scheduling your Wythe Sheet Metal Whole Home Duct Cleaning & receive $50 OFF the service!! !